Running an online business can be hard. That’s why certain resources and tools help make things easier and faster for you. But how do you know which are the best resources and tools to use? Should you go with free options or dive right in and upgrade to the paid version? In this post, I’ll be sharing with you the marketing tools, podcasts, technology, websites and even the people that have helped me grow my brand and online business. I don’t guarantee that just because you use a certain tool or resource I’ve recommended here means you’ll automatically see a jump in traffic or that you’ll rake in that magic profit number. Rather, this serves as a guide to help you when you’re considering what to use when building your creative business. These tools and resources have helped me save time and make my content creation process easier. When it comes to looking for a web host provider, you have to choose one that you can rely on. This is your business after all, and when you need tech support, you need it ASAP. I tested out SiteGround’s live chat before investing to make sure that the customer service was superb as what I’d read on multiple blogs. I remember asking them if the SSL certificate was included in their hosting plans because I wanted my site to be secure. True enough, before I even walked away from my laptop, a customer service representative replied to my query. With my previous blogs, I registered through WordPress.com. While WordPress is a trusted site and you can upgrade to their Premium plan, I wanted to have a self-hosted WordPress blog where I have complete control over all my website data. Since I was my blog as a business, I also opted to invest in the Genesis framework, a WordPress Theme. I did a lot of research on themes because I love a beautiful theme, but only wanted to invest in a quality theme. Genesis framework is like the foundation of a house, in this case, your blog. It needs a child theme to go with it for the design of your blog. Going back to the house comparison, a child theme is like the design of your house. Boss Pro is my child theme. I chose it because I had a specific look that I wanted for my website. I wanted a design that focused on growing my email list while looking feminine and professional. The home page was crucial for me because I wanted to customize it and have that landing page look. I love using Google Sheets to plan & map out my content. This is one of my favourite tools as I created an editorial calendar template that helps me stay on top of my content strategy. I also like to keep most of my blog content in one place, so I use Google Sheets for my editorial calendar and then I use Google Docs to write out my posts. Whenever I need to refer back to something on my calendar, I toggle between tabs. I never studied graphic design, so creating blog post headers or in-post collages and even Pinterest pins was a constant struggle. Canva is a website that has templates designed depending on what you need. They’ve got template for websites, Instagram posts and even stories! I no longer have to stress about how to create good graphics since Canva really helps me with this. There’s a free version of this, but the premium version has more features. What I do to save time especially when I have a certain template for my pins is to duplicate the design and all I have to do is tweak the copy and photo. Presets. With a preset, you can save all the edits you make on one photo, and apply it to another photo in just a few clicks. Adobe Lightroom has this feature, which I love. It has also saved me so much editing time. Before the world of presets and Adobe Lightroom, I used to use Photoshop to edit every photo. Can you imagine how much time I would spend on one photo set? Hours! With Adobe Lightroom, when you buy or create your own presets, all you have to do is select the photos and sync them. I still check each photo and do a couple of tweaks like adjusting the contrast or exposure until I’m happy with the image. This free tool studies your blog post headline and gives it a grade depending length, emotional impact, as well as the type of headline. It’s a great tool to use when learning how to craft headlines that stand out. This app has exploded over the last year or so. And it’s no wonder! They have such beautiful templates you can use for your Instagram feed or stories that instantly up your Instagram game and make it look professional. One of my biggest challenges when it comes to blogging and staying consistent is not having enough photos for Instagram and my posts. Did you know that because I wouldn’t have an image to go with a post, I wouldn’t post at all? I think that was one of the reasons why my previous blogs didn’t grow the way I wanted them to. With Unsplash, I have access to beautiful, high-quality stock photography. It’s helped me during the days I can’t go out and shoot new photos. I even use the photos from there to create pins and blog post headers. This tool that allows you to link your apps and automatically post it to another. For example, whenever I post an Instagram photo, that same photo is posted in my Facebook page. It saves me from having to manually post it on Facebook. You can even create your own formula as to what app you want to link to another. I’ve listed Facebook groups as a resource because I’ve seen how sharing my posts on those groups have helped. Facebook groups are also a great platform to do research. If you’re a travel blogger, join a travel blogging Facebook group. Chances are you’ll see fellow bloggers post about what they need help with. You can use this information as inspiration for a blog post topic or social media caption. For example, someone asks about how to use Pinterest. You can then create a post on your blog or on social media answering this question. Aside from research and promotion, you get to connect with people who are on the same journey as you are. It’s fun to connect with fellow content creators and help one another grow. Pinterest has been getting a lot of traction and for good reason. Many bloggers have claimed that majority of their blog traffic comes from this platform. As mentioned in my previous blog post, Pinterest is a visual search engine. I’m still studying how to use it effectively and to really understand what works and doesn’t work for me, but so far I’ve grown my Pinterest account reach to over 20,000 views in three months. At the moment, I’m figuring out how to translate the majority of those Pinterest views into blog traffic, but I do see that people check out my blog from Pinterest. It’s a start and I’m excited to see the number grow. I’ve heard many stories online about bloggers getting thousands of views per month through Pinterest. Planoly is an Instagram scheduling app that I use to plan my content. Though there are other Instagram scheduling tools out there, what I love about Planoly is that you can upload your content from your computer. Once your photos are uploaded in their app, you can switch your photos around to see how they’ll look on your feed. For me, this is a crucial functionality since I edit my photos using Adobe Lightroom on my desktop. I would rather skip syncing my photos via Airdrop to my phone to be able to save it in the Drafts section of Instagram. You can also create hashtag groups on Planoly, which saves loads of time. Instead of retyping hashtags every time you post, you can create separate groups that are made up of low to medium-sized hashtags for more visibility and reach. What I noticed about Planoly’s Instagram account is that when you tap on a photo in their feed, it is linked to a specific post. I think this is a feature from their premium plan, but at the moment I’m happy with their free plan. One of the limits to the free plan is that you can only upload a certain number of photos a month. Tailwind is a scheduling tool for Pinterest and Instagram. I particularly use it to grow my Pinterest account. Within the first few weeks of using Tailwind, I saw my Pinterest monthly viewers increase and today I’m at 21.6k monthly viewers. One thing I love about Tailwind is its SmartLoop feature which automatically loops your content. For example, I have a pin that I want to post every two days. Instead of manually pinning it every two days (not only is that super exhausting and I could potentially forget to pin because you know life…), Tailwind automatically posts my pin every two days. Instead of having to manually post every night or during every free moment I have, all I have to do is sit down once or twice a week to schedule my pins. I used to use Mailchimp, but with Converkit, I love how you can create multiple opt-ins and tag subscribers. For example, when I hosted a giveaway, I created a tag for those who joined my giveaway. When it was time to announce the winner, I only contacted that group. Multiple-opt ins were also a deciding feature for me because I want to experiment with different kinds of opt-in freebies depending on the type of post since I have different sections as well as the type of freebie that performs the best. If you have two distinct categories on your blog, you might want to create a freebie that’s targeted to the reader of that specific category. For example, you’ll want to create a travel-related freebie for readers who check out your travel guides and then a fashion-related freebie for readers who check out your fashion related posts. With Convertkit, you can create multiple-opt ins and personalise the email sequences depending on which freebie your reader signed up for. Swipe Up is a podcast that gives bloggers a better understanding of how to work with brands. The Purposeful Creative podcast is for creative entrepreneurs and talks about how to grow their business with purpose. Mindset is such a huge factor in growing your brand online. Being a creative entrepreneur, you face a lot of challenges and at times it can feel lonely if you don’t have a community or a tribe you can go to for encouragement and support. I have a list of positive affirmations that I tell myself that help me get excited and switch from a place of negativity to gratitude. I also have a vision board where I have positive affirmations printed and I remind myself of these especially on the hard days. Ah, yes, Google Analytics. If you’re a blogger, I’m sure you’ve heard about this resource at one point. One of my goals is to take a course that specialises in understanding the ins and outs of this tool. Last year I took an online digital marketing course that helped me understand the basics and how to set up things like a goal (tracking how many email sign-ups or conversions I get) and how to track the time an average reader stays on my blog. I highly recommend you sign up for this one (as it’s free!) and you get a better understanding of who are reading your blog and the type of content that they like. 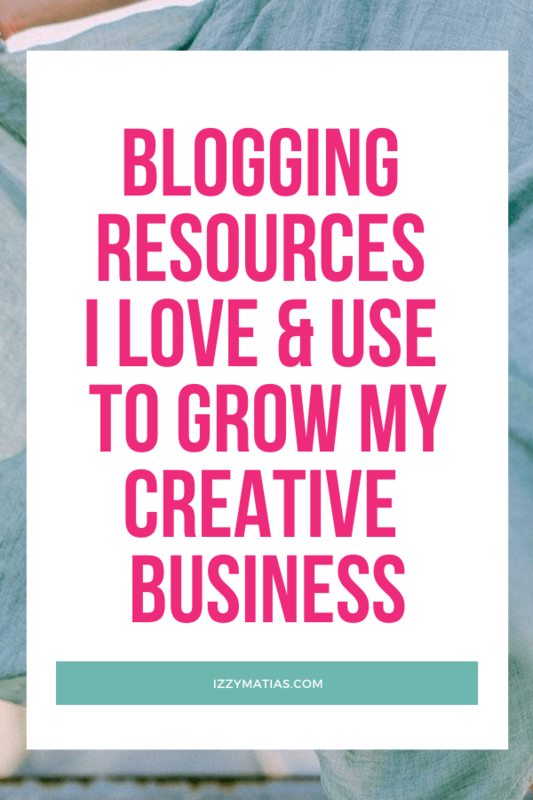 A list of blogging resources and tools I use to grow my creative business online. What tools do you use? Thank you, Marius! Love Canva. It makes it so easy to create graphics. What are your favourite blogging tools & resources?